It’s a neat trick, really. Your DVR creates a special Wi-Fi network that’s only used by it and the client. If your DVR doesn’t have a built-in adapter for that purpose (for example if it is an older HR44 or HR54 model) then a Wireless Video Bridge is used instead. Because the Wi-Fi network isn’t used by anything else, it’s easier to create a nice, smooth path for video to travel. The client itself is practically useless without that wireless connection — it has just enough software to decode and display the video stream and receive signals from the remote. With that wireless connection, it acts like a DVR and you can’t tell the difference. What about if it doesn’t work? In theory, a wireless client should work as well as a wired one. The signal travels through the air faster than it travels through a cable (only a bit faster but still) so there shouldn’t be any magic to it at all. AT&T’s own guidance suggests that the wireless connection should be good for 50 feet through 3 walls and that’s generally enough for most homes. Of course, that’s a theory. Plenty of people have said that they see sluggishness from a wireless client, or that the picture freezes more often than it does with other clients. There isn’t much you can do but there are a few options. 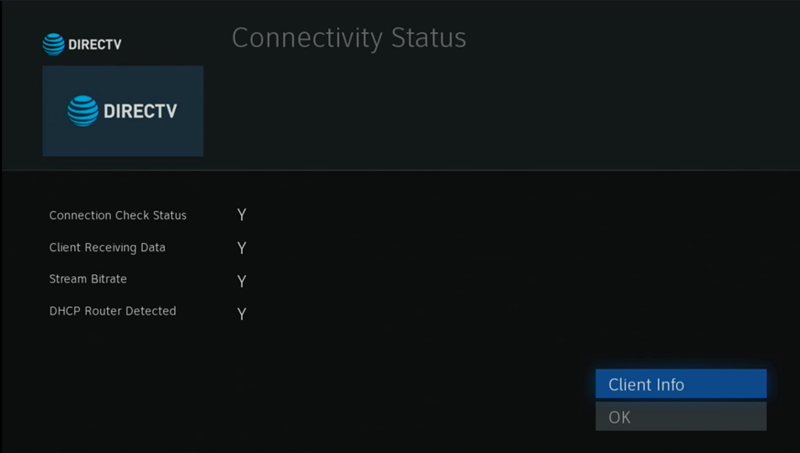 There is a front panel light on the client which gives you a general overview of the quality of the connection. You should be looking for a yellowish-green light. If you see an orange or red light, something is wrong. A flashing red light means no connection at all. Using a Genie remote, you can get some basic test results by pressing and holding the SELECT button. You don’t get much, but you do get a screen like this which is better than the green/orange/red light on the front. This test isn’t going to tell you much but if the Stream Bitrate isn’t “Y” then you can say for certain that the signal level is too low. The first line of defense should always be to reboot. I’ve had wireless clients that became instantly better after a reboot, and as long as I rebooted them every 4-5 days they were always fine. A reboot on any Genie client is very easy. See that red button on the side? Push it and wait 2 minutes. That’s all there is to it. If that doesn’t work, try relocating the client. People tend to put the client behind the TV or even worse, in a drawer. Because the client uses an RF remote, you don’t have to be pointing at it. Try moving it closer to the DVR or higher up in the room. The client can be as much as 50 feet from the TV if you use a long cable like this one. You may find that moving the client really makes a difference. Truthfully there isn’t much more that you can do with these devices. They aren’t very complicated to begin with so there isn’t a lot to diagnose. You could change over to a wired client, but there’s no guarantee that would make all your troubles disappear. And of course, you put in a wireless client in the first place because you didn’t want to run wires. I do know for certain that AT&T’s engineering staff does continue to upgrade these devices so, your last line of defense is a call to their call center at 800-DIRECTV. If enough people complain, then the problems get moved up on the priority list.